31 1ST READER "I protest this line of inquiry...The Confronter is aware of the ground rules. He knows the source of the Book of Life...He's trying to deliberately unnerve Mr. Lincoln." 1ST SPECTATOR "That was a clever move...Mr. Lincoln was flush...it's hard to see behind that devilish, ethereal glow." 3RD READER "I bow to my betters here. I was just jesting and sailing along on my forensic zeal, as Mr. Lincoln, suggested one in the profession might do. I apologize Mr. Lincoln, for in truth, I do not know who your parents were. I trust the Good Book does. That you came from meager beginnings is well documented. There is, however, a personality flaw that often shows when a man rises far above his source." 1ST READER "I would like to inject that my associate says he does not, in truth, know Mr. Lincoln's source...therefore, anything he might say from this point seems untenable." 3RD READER "Of Mr. Lincoln's source, I confess my ignorance, but your nature to abandon the rock of the Book of Life, and help yourself to the laurels of my poor tree of reasoning, we can well see. I suggest that this flaw in you is what made anxious to champion the cause of Mr. Lincoln. Perhaps you know full well the flaw of those personalities, who for the sake of political position, will comprise truth, as easily as you slide from the Rock of the Book of Life." 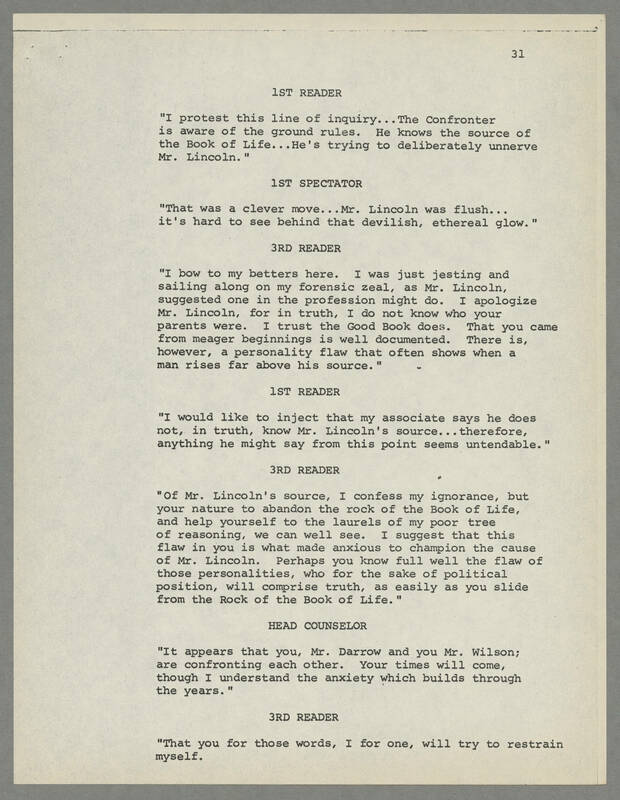 HEAD COUNSELOR "It appears that you, Mr. Darrow and you Mr. Wilson; are confronting each other. Your times will come, though I understand the anxiety which builds through the years." 3RD READER "That you for those words, I for one, will try to restrain myself.